NIGHTWATCH® offers peace-of-mind protection for < $1/day* so you can sleep easier and intervene sooner. It's groundbreaking when an invention comes along with the potential to impact survival and quality of life outcomes. Yet, that is exactly what NIGHTWATCH® is poised to do. After 5 years in development, the life-saving device has received regulatory clearance and is available to horses in the United States and Canada. NIGHTWATCH® smart halters are designed to offer peace of mind. They are not intended to diagnose, treat, mitigate, cure, or prevent any disease or condition. NIGHTWATCH® acquires and analyzes real-time data on your horse's vital signs and behaviors, continuously looking for signs of danger/distress such as colic, being cast, and foaling. NIGHTWATCH® uses novel radio frequency technology (ie, ultra-wideband impulse radar [UWB-IR]) to monitor your horse’s heart rate and respiratory rate, the two most important vital signs that correlate with pain and acute distress in horses. UWB-IR is a safe and very low energy radio-frequency technology that measures physical changes in the vasculature and soft tissue beneath your horse’s skin that correlate with their heart rate and respiratory rate. Historical data shown via the NIGHTWATCH® Web App on an iPhone. NIGHTWATCH® smart halter with embedded electronics shown. NIGHTWATCH® is an early warning system that automatically alerts you at the first signs of danger/distress in your horse (via text, phone call, and email). After setting-up your account preferences, NIGHTWATCH® will alert you and up to 4 additional caretakers when a predefined threshold of danger/distress is breached. To accommodate the widest number of use cases, NIGHTWATCH® offers two alert modes, smart and manual. In smart mode, thresholds are your horse's EDI® score where as in manual mode you can customize upper and lower limits on any of the other 4 metrics, including their heart rate, respiratory rate, number of times they roll, and time spent lying down in a recumbent position. Smart Mode: When your device is placed in the smart mode, the system is looking for deviation in your horse’s normal physiologic parameters (i.e., biometrics, behaviors) that correlate with pain and distress. This mode requires a “learning” period of up to 30 days while your horse is healthy and in their normal and natural environment. Manual Mode: When your device is placed in manual mode, you have the ability set your own upper- and lower-limit thresholds for up to 4 parameters to trigger an alert. By placing your device in the manual mode, you can utilize your device immediately out-of-the-box and bypass the “learning” period that is required in the smart mode. Alert notifications can be sent simultaneously as a broadcast until the alert is acknowledged. 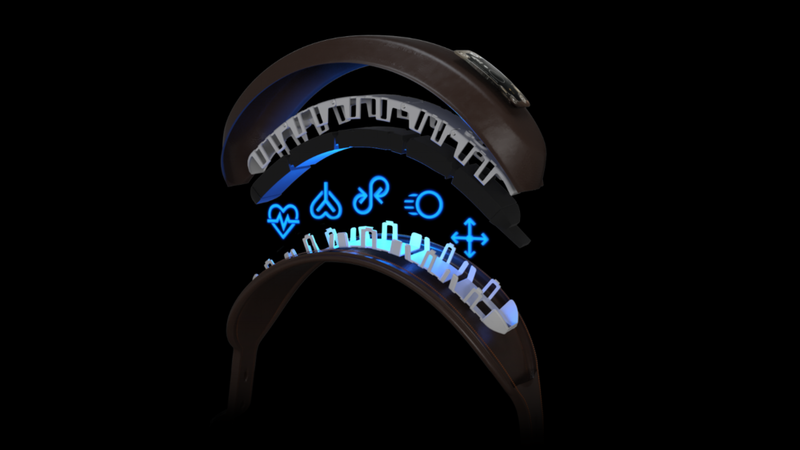 A status LED light on the ID plate of each NIGHTWATCH® halter further offers a visual indicator of your horse’s state. Just look for the green light for reassurance your horse is happy and within their normal/non-distress state. NIGHTWATCH® provides 24/7 access to actionable insight and historical information on your horse from the convenience of a smartphone, tablet, and computer. Simply log into your account and view real-time and historical information on your horse's EDI® score, their vital signs and behaviors, GPS location, history of issued alerts, and more. Your horse’s EDI® score is an objective measure of their relative distress and general well-being, and derived using a fuzzy inference system with multiple parameters, including biometric and behavioral inputs, environmental conditions, pre-existing risk factors, and more. Environmental conditions: Location, time of day, etc. Pre-existing risk factors: Medical history, habits, etc. The Equine Distress Index® (EDI®) is a proprietary 10-point scale, offered exclusively by NIGHTWATCH®, used to quantify relative distress in your horse at any given point in time. The lower your horse’s EDI® score, the happier and healthier they are. Equine Distress Index® and EDI® are registered trademarks of Protequus LLC. * Cost of a monitoring contract/license agreement (after initial purchase). All orders will be processed within 5 business days.